Liberty News Forum › LNF Forums Here › Political Opinion Page - The Hot Seat › Was Bill O'Reilly at Selma too? 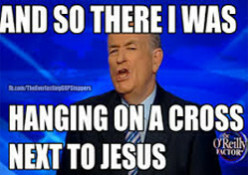 Re: Was Bill O'Reilly at Selma too? Did you fail U.S. History? As someone who took history in the USA, that seems unlikely. She's heard of Selma, she spelled it correctly. What more can you really ask of a student? Still trying to figure out, what the hell, Billo has to do with Selma? It could have been an interesting story, if his name was not on the title. Is there a book, "Killing George Wallace"? Rule62: Don't take yourself too seriously. Just got through listening to Obama's speach at the bridge, on this, the 5oth anniversary of the March at Selma. Obama, for the very first time, was able to speak from his own heart, what is written on his heart and not one word, was partisan. I was shocked. I did not know he had that in him. Kudos, Mr. Obama. Though I have never been a fan, you knocked that out of the park. Anyone who tries to make that partisan, is less than a fool. Finish your term, with those words you spoke, in mind and you have your legacy. You are at your best, when you are not reading from the teleprompter, the canned words from the partisan asshats, you are surrounded by. Great job, Mr. President. Today, you rose up from out of the sewage of politics and showed the country, something real. Well .. he has already done the damage, so, why not play pretend. He's always done a little of both. Stupid....just stupid. I thought you were more capable than this. You win this one and proved me wrong. Congrats!